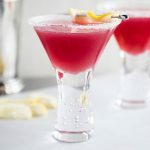 Easy lemon drop cocktails with cranberry raspberry juice for a fun twist. Throw all the ingredients into a shaker. Add ice and shake well. Pour into a chilled glass with sugar on the rim. ENJOY. Take a slice of lemon or lime and run it around the top edge of your glass. Quickly dip the rim of the glass in sugar (pour some sugar on a plate or dip it directly into a large container of the stuff) and boom! Done. If you don’t have any citrus around, you can dip your finger in water and run it around the top of your glass. Water on a plate also works well – dip the top of the glass into the water, then into the sugar. I get a TON of questions about these martini glasses! The glasses pictured are the verve glasses from Crate & Barrel. I also love these stemless glasses from Amazon. For more cocktail inspiration, try this Blackberry Whiskey Lemonade or my Triple Berry Margaritas!